Houston Premises Liability Lawyer | Simmons and Fletcher, P.C. Premises liability is the area of law dealing with liability for injuries that result due to some condition or use of property. This can range from the grocery store slip and fall to unprotected swimming pools to dangerous conditions in amusement parks. The basics of this are that the person is injured on someone else’s property and that person was under some duty to prevent or reduce the risk of the injury from occurring. Premises liability law is very complex. It is very easy for an unwary victim to get re-victimized by an adjuster who takes advantage of their lack of knowledge. For this reason it is very important that you speak to a premises liability lawyer as soon as possible and not give any recorded statements. At Simmons and Fletcher, P.C., we have handled hundreds of premises liability cases. Call us for a free consultation. Premises Liability Law is the area of law that covers a property owner’s responsibility for injuries that occur on the property. Just because you are injured on another person’s property does not mean they are automatically responsible for your injury. As a general rule, to win a premises liability case, you must prove four things: 1) A duty owed, 2) breach of the duty; 3) proximate cause, and; 4) damages. A property owner is not an insurer of the property. Whether the premises in question is a residential property, commercial property or farm/recreational property all play into what laws apply and what duties are imposed upon the landowner. Also, premises liability law imposes different duties upon land owners depending upon the status of the injured person while on the property. The duty owed to an “invitee” (a person who was invited to be there by express or implied invitation) is generally a higher duty than that owed to a “licensee” (a person who is on the property for his own personal business only or a “trespasser” (a person without permission to be on the land). In addition to the above, when the landowner is a landlord of the injured person, there are additional contractual duties that can arise under the rental contract such as the implied warranty of habitability. All of the above status and duty issues must be fully explored in every case. Once a duty has been established, then you must show the property owner breach his duty. In a typical premises case, this means you must show that you must prove the property owner was aware of a dangerous condition or should have been aware of a dangerous condition and that he failed to either remedy the danger or adequately warn you against it. An important note about this issue is that the evidence easily disappears. Often videos get “recycled” or the cause of the injury gets repaired and discarded. Thus,it is very important that you retain a good personal injury lawyer to send a spoliation letter demanding that the evidence be preserved and turned over at an appropriate time. Delaying in calling an attorney can result in the permanent loss of critical evidence in these cases. 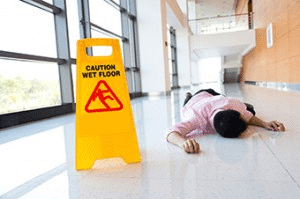 Thus, if you have been injured and think you may have a premises liability case such as a slip and fall or trip and fall, call us immediately for a free consultation. “Proximate cause” requires that you prove that the negligence which created the danger posed to you caused the injuries you have. In other words, you must show that you did not have knowledge of the danger and ignore the warning or risk yourself. You must also show that you were acting reasonably and not the sole proximate cause of your own injuries. Call Simmons and Fletcher, P.C.’s premises liability attorneys for a free consultation about your premises liability case today. If you are on a commercial property such as a grocery store, gym, office or other place of business, they will likely have a process for documenting incidents. Contact a manager and file a report as soon as the accident occurs. The sooner a store gets notice of the incident, the more likely they are to preserve any video evidence. If you are on the job when the injury occurs, you need to file a worker’s compensation Initial Report of Injury immediately. Failure to file one of these within 24-48 hours could result in your loss of a right to pursue compensation. What you observe may determine whether you have a case or not, so always be alert. If you are physically able, take photographs of the condition that caused your fall. Even if a video exists and can be obtained, water on a white floor can often be very hard to see on a video. If you are able to take a photo that can show the condition and/or the source of the condition, this can be very beneficial to your case. If you do not want to get treated unfairly, your best bet is to seek care promptly and follow the doctor’s orders. A picture is worth a thousand words. Getting fair compensation means giving the jury a mental image of everything you went through. Photos in the emergency room can go along way toward showing what you endured. In addition to that, documenting your injury shortly after the injury and throughout the healing process can help jurors understand what you went through. Try to take pictures to document any changes in the injury, treatment and/or healing process to help tell your story. Take negligent landowners to trial. If you have been injured as the result of a property owner’s negligence, contact us today for committed representation in your premises liability case. We do not take any payment of attorney’s fees unless we win a settlement or verdict for you. We are located next to the Memorial City Mall in Houston, Texas. We handle serious injury cases across the State of Texas and are more than happy to work with you via, email, Skype, phone to make handling the case a convenience for you. We also have investigators and lawyers who travel to investigate and explore cases where they happen. Contact us today for committed support in your premises liability case. The difficulty of the grocery store slip and fall case. The difficulty of the premises liability case in Texas hospitals and medical facilities. Walmart slip and fall accidents. Review: 5/5 ★ ★ ★ ★ ★ ” This firm did an excellent job in representing our family. Not only are they very knowledgeable but are also very polite and always communicated through the whole process. A special thank you to Amanda for her helpful updates and hard work.” – Theresa R., actual client.